Are You Looking For A Natural Stop Smoking Remedy? With smoking becoming not only anti-social but now outlawed in many countries, the search for an effective, natural stop smoking remedy is more furious than ever before. Perhaps it would be best to begin with a definition of what we mean by “natural.” After all, there can be few, if any, more widespread unnatural things to do than the voluntary inhalation of poisonous, noxious fumes many times every day! No one made you do that, and there is certainly no instinct for it! Hence, the search for a “natural stop smoking remedy” has the in-built irony of being a natural way to help you to desist from doing something entirely unnatural! Let us assume that natural in this sense would mean not placing any more artificial substances in your body. Nicotine patches, gum, sprays or other means of administration therefore need ruling out. They don’t come with actual fumes, but the ingredient that keeps you hooked on tobacco is, of course, nicotine, (ask anyone who’s ever tried to quit by switching to “herbal” tobaccos). Therefore, finding another way to administer the same drug is one of the toughest ways to quit, and the failure rate is quite high. Where they succeed, it is only (in this author’s opinion), because they force you to break up the routine of lighting up, inhaling and exhaling and so on. Furthermore, they enable you to “ingest” nicotine, (a powerful insecticide!) in areas where smoking itself would be forbidden, so once again, you are feeding yourself unusual behaviour patterns. The “habit” or routine of smoking is thus tampered with, but the cravings aren’t dealt with and often the wearer/chewer only wishes for a cigarette, often ending up doing both. (This is a very dangerous practice incidentally, as too much nicotine can cause a heart attack). Then we have hypnosis. This is far closer to our quest for a natural stop smoking remedy, but is sadly often misunderstood or misrepresented. The smoker is hoping for a completely passive “cure” from the therapist in many cases. The expectation seems to be that you will turn up fully addicted to smoking, whereupon you will be rendered by means of a swinging pendulum, into a zombie-like state of which you will have no awareness or recall. When you are brought out of this state, you will in all other respects be restored to your normal, cheerful, sunny self with the single exception that the desire to smoke will have completely and utterly vanished! Ah! The quest for the holy grail of both smokers and therapists alike! Let me tell you now, if you go to a hypnotherapist that is about as far from what will happen as your next encounter with a real monster from Star Trek! The reality is that you will be completely aware of the hypnotherapist’s suggestions and although hypnosis can unquestionably smooth the transition from you being a helpless addict to becoming a happy non-smoker, you will still need to consciously apply your new “programming” especially in the first few days whilst the nicotine departs from your body with the inevitable “pangs” accompanying that process. Surely the most natural stop smoking remedy must be good old fashioned “cold turkey.” Statistically if you choose this route you have a 10 per cent chance of staying free for life. However, you are likely to become one of those whinges who spends the rest of your days wishing you could have “just one more puff.” The best natural stop smoking remedy of all then would surely be one where no artificial “gimmicks” are required, (by the very definition of “natural stop smoking remedy” – this goes without saying). Furthermore, you should understand every step of the process, and finally you should not be wrestling with your own willpower – the emotional desire to smoke versus your logic trying to restrain you – for the rest of your days. Indeed, you shouldn’t have to endure that agony at all! Quite possibly the ultimate in natural stop smoking remedies (since it fulfils all of these criteria) is one which employs NLP (Neuro-linguistic programming – but don’t bother looking it up unless you’re one of those geeks who needs to look under the bonnet of your new Porsche instead of just enjoying the experience of driving around in it!). NLP works for smokers because it utilises the very mechanism we use when we simply change our minds about something. You don’t need willpower to decide you no longer take sugar in your tea, or that you now love Robbie Williams’ music … or whatever. If ever there was a way to pull yourself out of the hole you got yourself into with smoking, this surely has to be it because it bypasses the need for willpower – every smokers’ nightmare. Champix, a prescription drug marketed by Pfizer, is prescribed for the treatment of smoking addiction. Its generic name is Varenicline Tartarate, and it belongs to a family of agonists known as nicotinic receptor partial agonists. Thus, the intake of Champix not only reduces the craving for a cigarette, but also, helps in decreasing the gratifying effects of smoking a cigarette or using various other tobacco products. The intake of Champix leads to the activation of specific receptors in the brain. In doing so, nicotine is stopped from attaching itself to these receptors. Typically, when people smoke they experience a feeling of reward in the form of pleasure. Champix prevents this specific feeling of reward. A person, thus, gradually loses his/her dependency on nicotine. At the end of the course, the person can quit smoking without any difficulty whatsoever. One of the advantages of Champix is that you can start the course just a week or two before you actually want to quit smoking. Typically, what one needs to do is decide the ‘stop smoking’ date. You can then start on Champix a week or two before that date. Champix fortified with just a little bit of will power will help you stop smoking by your set stop date. Champix is available in weekly dosage packs; therefore it’s easy to take. A starter pack is available, which is configured to last for 2 weeks. This pack contains 1mg and 0.5mg tablets. For easy recognition both the tablets are coloured differently. For the first few days (1-3 days), a person is prescribed a daily dosage of one 0.5mg tablet. Between days 4 and 7 the dosage is increased to two tablets of 0.5 mg daily, one in the morning, the second in the evening. Day 8 onwards, the 1 mg tablets must be taken, two times a day (morning and evening). It is advisable to take Champix after meals. It’s also advisable to take the tablet with a full glass of water. If you miss a dose, do not take a double dose. Nausea is one of the common side effects of Champix. The less common side effects of this medication include insomnia, headache, and strange dreams. There are also some rare side effects associated with the intake of this drug, which include abdominal pain, constipation, and a tendency towards flatulence, vomiting and change in taste. Some users of Champix have also reported instances of depression, drowsiness and various other instances of erratic behavior. Every smoker who wants to quit smoking and is above 18 years of age can use Champix. This is considered the basic eligibility requirement for taking Champix. It’s important to consult a doctor before beginning a course of Champix varenicline. More importantly, you must apprise the doctor of any and every medical condition that you might be suffering from and the medicines that you are taking, if any. This is because varenicline might react adversely with other medications and also show contraindicative symptoms and side effects. If a person has a history of mental illness, it would be advisable not to take Champix, as some people have reported an inclination towards aggressive behaviour due to the use of this medication. On the whole, Champix as a drug has not only proven to be safe but also effective with respect to bringing about the cessation of the smoking habit in a person. At the end of the day, only those who really want to quit smoking must use Champix. A person should be prepared to face some of the side effects associated with Champix and also the withdrawal symptoms that one might face. The most popular ways to quit smoking include homeopathic remedies, drugs, injections, pills and Nicotine Replacement Therapies. But how effective are they? Homeopathic quit smoking remedies might sound like the most attractive option, but do they really work? These generally release chemicals into your body (not nicotine) that cause endorphins to be released. This brings a feeling of well being – which is supposed to replace the buzz you get from smoking a cigarette. Nicotine Patches – These are applied to your skin, and they slowly release nicotine into your body to replace any nicotine you would have had from a cigarette. Nicotine Gum – Chewed like chewing tobacco, and then spat out. Nicotine Nasal Spray – A nicotine ‘mist maker’ that you squirt up your nose frequently replace the missing nicotine from cigarettes. The idea is to that you are weaned off as you gradually lower the dose. Nicotine Inhalators – These are like the ‘puffers’ asthmatics rely on, but they contain nicotine. You use the inhaler to take in a mist of nicotine instead of inhaling smoke. There’s a range of homeopathic quit smoking remedies available – such as homeopathic cigarettes, herbs and herbal pills etc. Homeopathic Cigarettes contain homeopathic ingredients that help calm you during withdrawal cravings. These non-nicotine cigarettes contain different herbs that are supposed to sooth your smoker’s withdrawal symptoms. One herb used for this is as a homeopathic quit smoking ingredient is ‘Lobelia inflata’. This is similar to nicotine, and has the same apparent calming properties as nicotine, but isn’t addictive. Homeopathic doctors supply various herbs and drugs – often in pill form to alleviate the withdrawal symptoms of quitting smoking. For example, Avena Sativa or Valeriana are prescribed for the sleeplessness and fatigue caused by lack of nicotine. Aconite is provided to manage irritability. Bad news: drug and homeopathic ‘cures’ don’t work because they don’t fix the mental addiction. Sadly, none of these remedies can really work alone – not the drug-based ones, nor the NRT ones, nor the homeopathic ones. Your physical addiction might be warded off by an injection or by herbal pills, but that’s only 10% of the problem. The remaining 90% is the mental addiction. You must kill the mental addiction – and if you do, the physical addiction is so mild it disappears within a few days. This is one of the natural remedies to quit smoking that helps you with your physical dependency of cigarettes. It also helps you with the psychological as well as with the emotional effects of smoking. The manufacturers of Avprin realized that smoking addiction takes over your whole life. Their answer was a three step stop smoking kit. This kit helps to make you completely smoke free and it ensures that you stay stopped. How does the Avprin three step Stop Smoking kit work? Step one mimic the effects of nicotine to your body, you will become less dependent of nicotine and cravings will be reduced. Withdrawal symptoms are reduced and quitting becomes much easier. The natural ingredients in step one also helps to prevent depression that is very likely to occur when trying to stop the smoking habit. Avprin step one also contains terpene lactones that protect your nerve cells and regulate the tone and elasticity of your blood vessels making blood circulation much more efficient. Step two of these natural remedies to quit smoking includes Zetacap. Zetacap is used for weight control while busy with the process of stop smoking. The ingredients in Zetacap help to fill your stomach. It is a high fibre supplement that you take before meals. Zetacap forces you to eat less, but still feels satisfied. It helps you not to replace smoking with eating, preventing you from replacing one bad habit with another. Avprin step three is an all herbal support formulation. It supports the body in ridding itself of nicotine and other toxins stored in the body during the years of smoking. The support formulation also helps to relax your stomach, take away stress, prevent anxiety, soothes and protects your mucus membranes and it helps to prevent and treat any coughs that could develop while quitting. 1) The ingredients of this quit smoking product are safe, all-natural and non-habit forming. 2) A success rate of 93% is claimed. 3) A guide book and a CD are included to help you to deal with your nicotine addiction and to make the process easier. 4) A 100% money back guarantee is offered if people think Avprin does not work or misleads them. Some people have complained that the product is too expensive, but the feeling is that this product targets so many challenges quitters may face, that it is really worth the money. My feeling is that this is one of the most complete quit smoking systems that are available. It does not only help you to quit smoking it also leaves you refreshed and addiction free. Return from natural remedies to quit smoking to Natural ways to quit smoking. Go to quit smoking at once. If you have ever made the journey, you may be aware that there are several natural remedies to stop smoking available. Although, a stop smoking aid can be a valuable resource, the determination must come from within. Remember that the desire to quit is only effective if you stick to that decision rather than try to sneakily appease the craving each time it arises. To beat the habit, you need willpower; to help you, you many need natural remedies to stop smoking. Some of the leading natural remedies to stop smoking, while offering the minimal amount of side effects, are herbs. In choosing herbs as a natural aid to stop smoking, it is best to do some research before beginning. While herbs have long been used as natural remedies to stop smoking or to relieve withdrawal symptoms, there are some herbs that have been known to present their own side effects. The best route is to seek advice from an expert before beginning any plan of action. Herbs, when they are used as natural remedies to stop smoking, come in a variety of forms. Some people use herbs in the form of tobacco as a way to help them ease into the transition of being smokers to non-smokers. Teas and supplements are other herbal forms that many use as natural remedies to stop smoking. Herbals teas are fast becoming the choice of many because they provide a calming effect when nicotine withdrawal sets in. Unconventional methods, also known as alternative medicine, are also popular for stop smoking. Of all the choices available, acupuncture is considered as one of the most effective options available. The procedure includes inserting long, thin needles to exact sites located on the body. Acupuncture works on the premise that our body has certain points that, when pressure is applied on those points, will either heighten or reduce a craving such as smoking. It has been found that acupuncture is effective in controlling cravings to smoke. Massage, not necessarily one of the most famous ways to stop smoking naturally, however, can be an excellent means to lessen the side effects associated with withdrawal symptoms. Utilizing the therapeutic benefits associated with massage can be a great way to relax when dealing with the stress involved with quitting cigarettes. There are many methods available to guide you in the right direction such as patches, chewing gums, laser treatment and even an anti-smoking injection. Not many people promote the natural methods which are readily available to give the same outcome. The use of herbal remedies have been proven to be just as effective and healthy as the other ‘non natural’ methods. Nicocure is one of the most successful herbal remedies to stop smoking on the market which can effectively guide you in the right direction to finally stop smoking and lead a much healthier life style for good. The reason why people start smoking again after a short break from it is due to the side effects of tension, stress, and other nervous conditions so that makes the person break down and give in to their temptation. This is where Nicocure kicks in. Nicocure can eliminate any nicotine in your body naturally and it doesn’t give any nasty side effects so the chance of giving up smoking for good is much higher by using these natural herbal methods. The natural method has the approach of reducing the nicotine in your body whereas methods such as patches or chewing gums contain nicotine which will add to the nicotine in your body making the craving as strong as before. By eliminating all the nicotine in your body naturally will remove the craving and you can get on with your new life. If you have ever made the journey, you may be aware that there are several natural remedies to quit smoking being available. Although a stop smoking aid can be a valuable resource, the determination must come from within. Remember that the desire to quit is only effective if you stick to that decision rather than try to sneakily appease the craving each time it arises. To beat the habit, you need willpower; to help you, you many need natural remedies to quit smoking. Some of the leading natural remedies to quit smoking, while offering the minimal amount of side effects, are herbs. In choosing herbs as a natural aid to quit smoking, it is best to do some research before beginning. While herbs have long been used as natural remedies to quit smoking or to relieve withdrawal symptoms, there are some herbs that have been known to present their own side effects. The best route is to seek advice from an expert before beginning any plan of action. Herbs, when they are used as natural remedies to quit smoking, come in a variety of forms. Some people use herbs in the form of tobacco as a way to help them ease into the transition of being smokers to non-smokers. Teas and supplements are other herbal forms that many use as natural remedies to quit smoking. Herbals teas are fast becoming the choice of many because they provide a calming effect when nicotine withdrawal sets in. Unconventional methods, also known as alternative medicine, are also popular for quit smoking. Of all the choices available, acupuncture is considered as one of the most effective options available. The procedure includes inserting long, thin needles to exact sites located on the body. Acupuncture works on the premise that our body has certain points that, when pressure is applied on those points, will either heighten or reduce a craving such as smoking. It has been found that acupuncture is effective in controlling cravings to smoke. Massage, not necessarily one of the most famous ways to quit smoking naturally, however, can be an excellent means to lessen the side effects associated with withdrawal symptoms. Utilizing the therapeutic benefits associated with massage can be a great way to relax when dealing with the stress involved with quitting cigarettes. Natural remedies to quit smoking are alternatives to the harsh chemicals and unwanted side effects of conventional medicine. However, while natural remedies to quit smoking may work for some people, they may also prove ineffective for others. If you are a heavy smoker, you know where your life is leading to. Actually you may never have a long life if you are a heavy smoker. This is why you have to find out which stop smoking remedy can give you a flourishing life starting with the control of your nicotine intake. 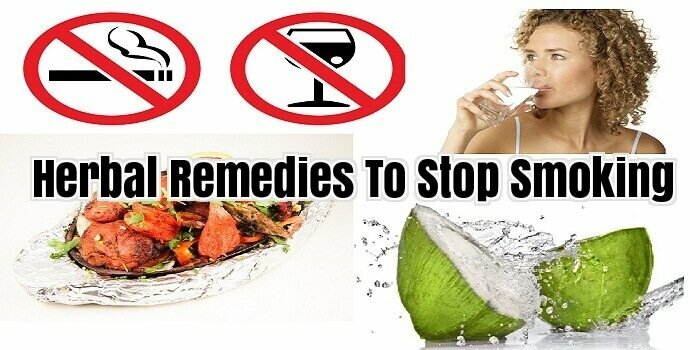 Fortunately there are natural remedies that have been explored and tested to help people refrain from smoking. This is one of the most commonly used therapies that aid people control their addiction to smoke. Hair-thin needles are inserted into different points of the body particularly on the ears to remain there for 20 minutes. Some acupuncturists tape tiny balls on their patients’ ears and when there is a sudden craving to smoke, the smoker just presses gently on the ball which stimulates the acupuncture point. This herb is found in many anti-smoking products and is said to be very effective in fighting the effects of nicotine withdrawal. Its active ingredient lobeline is believed to have similar properties as nicotine because it also increases the level of neurotransmitter dopamine into the brain so instead of nicotine, this herb will serve as a replacement. However, this herb has the potential to be toxic so the use of it should be supervised by a qualified health practitioner. This is another stop smoking remedy in herbal form. Although used primarily as a natural product to treat depression, some pilot researches proved that it can help people to quit smoking. If you want to try its positive effects better ask your doctor about it. Taking it can be most effective also if paired with cessation counselling. This is a very popular root plant that can prevent the brain from inducing the release of neurotransmitter dopamine. Dopamine makes people feel relaxed after smoking. It can also help the smokers revitalize their energy level and at the same time their cravings to smoke is altered. However, more studies should support the benefits of ginseng to control addiction to nicotine. This is a matter of mind control over body cravings but considered an effective stop smoking remedy. Many studies have been conducted on the effectiveness of hypnotherapy in arresting the cravings to smoke. Its methods involve the hypnotherapist exploring the subconscious mind of the patient to find and analyze what makes the patient addictive to smoking. All the negative factors including past experiences that have contributed to nicotine addiction will be replaced with a more positive state of mind so that the mind of the patient will be conditioned and leave the use of cigarettes altogether. Any of these stop smoking remedies can be explored depending on your faith and acceptance on their potentials. Just remember that if you think you are on the verge of destroying yourself due to your addiction to smoking, do not hesitate to try any of these alternative sources. Modern medicine has come up with remedies for people who want to stop smoking. But, there are also stop smoking herbs for those who want to quit the natural way. From drugs that imitate the effect of nicotine, to medicines that calm and soothe the anxious mind, smokers who want to quit have a lot of opportunities to start leading a nicotine-free life. As with all science-based medications, most of these drugs come with certain side effects. And this is why many people have been seeking natural remedies to help them stop smoking. There are a number of herbs that have long been proven helpful for smokers who want to quit. These stop smoking herbs have different effects on the body, but all contribute to making the quitting process easier for the smoker. These herbs are commercially available in dried bulk form, or processed capsule or liquid extract. When using any of these herbs, make sure to follow the label instructions. Herbs that are bought in dried form are usually taken as tea, and never rolled in paper and smoked as tobacco. Lobellia: Lobelia is a highly potent herb that works to relax the mind and body. When you try quitting, it is normal to feel anxious as you crave for nicotine. Lobelia has calming properties that help you manage your anxiety. It is also said that Lobelia makes cigarettes taste bad. St. John’s Wort: St. John’s Wort is one of the more popular stop smoking herbs. It promotes mental health and leaves a person feeling positive about him. This is highly recommended for the early stages of quitting. Black Cohosh: Black Cohosh, on the other hand, has multiple indications. It is best for women who require balance in their monthly menstrual cycle. It also has mild sedative properties that help to ease anxiety, associated with quitting. Blue Vervain: Blue vervain also has natural calming properties, just like black cohosh and lobelia. It is also indicated for insomnia. Catnip: Catnip is especially indicated for the digestive system. It works by calming the digestive system and getting rid of indigestion, headache and even upset stomach. Catnip likewise cures chronic coughing and prevents insomnia attacks. Hyssop: Hyssop helps the body’s natural curing properties by clearing the mucus in the lungs – an effect of COPD. Aside from this, hyssop also manages anxiety and treats hysteria that may come with withdrawal. Korean ginseng: Korean ginseng, a widely popular herb, is also helpful for quitting smoking. It has been found to increase the body’s energy levels as well as help the body manage stress levels. As a result, the anxiety related to the quitting process is also alleviated, as the body learns to adapt to decreasing nicotine levels. Mimosa Tea: Mimosa is an evergreen shrub. The root bark Mimosa tea will lift your mood and leave you with a calm feeling, if you are suffering from depression and anxiety from nicotine withdrawal. This is recommended as a replacement for antidepressant chemicals as it is not addictive. It is one of the stop smoking herbs. Sage: one of the stop smoking herbs also known as salvinorin: This is taken as a tincture; after effects of this herb are said to be calmness, improved moods, sensations of insights, and a connection with nature. It is not addictive and can be used as a stop smoking herb. Sarsaparilla Root Powder: One of the main symptoms that citizen dread when are trying to quit is weight gain. This herb is responsible for offsetting the discount of acetylcholine (this is a neurotransmitter that controls vigour levels that is normally stimulated by nicotine). A follow of this is your weight gain being controlled and your body’s reactive abilities being improved. For smokers, herbal remedies are increasingly becoming a popular choice for smoking cessation. One of the most popular alternative methods to stop smoking is herbal remedies. There is some evidence that passion flower was used by the ancient Aztecs. It is also a popular herbal remedy in Europe. Passion flower is known to be an effective remedy for anxiety and nervousness, symptoms that usually accompany nicotine withdrawal. Passion flower is a safe alternative to nicotine. However, women who are pregnant or who are breastfeeding should consult a doctor before ingesting passion flower. Like passion flower, skull cap is a popular herbal remedy used to fight anxiety and depression. In addition, it has inflammation properties as well. Although it won’t help to treat anxiety and depression caused by nicotine withdrawal, Elderberry has very potent anti-oxidant properties. Anti-oxidants are important because they fight free radicals. Free radicals cause damage to the body’s tissue. Many free radicals are created by smoking. A common spice used in Indian food, Turmeric has been shown to help remove carcinogens that smoking produces in the body. Holistic medicine is based on a holistic approach to mind / body healing that is particularly relevant to quit smoking. Smoking is a habit that involves your thought processes, beliefs, emotions and everyday behaviour, in addition to the physical component of nicotine addiction. It is, therefore, logical to use strategies that include smoking cessation these different aspects of your habit, in order to successfully overcome once and for all. Herbal formulas to help stop smoking have been found useful by many people and are gaining popularity as an alternative to stop smoking “cold turkey” or using therapies nicotine replacement (NRT has) that can prolong your body needs the drug. the cleaning and detoxifying your system, often visibly, if you no longer want to put poisons into your body. Stop smoking remedies using herbs are also available in a variety forms, including teas, capsules, patches and similar to the more commonly known nicotine patch. Patches are particularly useful because their consistent delivery of ingredients to quit, protect you against cravings and help you throughout to resist the temptation day. It is important to remember that although the herbal treatments are “natural” does not guarantee their safety, so that these products must be used under the supervision of a qualified practitioner. Plants can also interfere with other medicines if you are combining the approaches, Caution and advice from a health professional. More comprehensive strategies that can help you stop smoking are acupressure, meditation and yoga, or the use of a technique of deep relaxation. Answer to your underlying reasons for smoking such as stress and boredom make your quitting process easier and more efficient, to investigate your smoking habit and find a plan to stop smoking approaches that of all angles. Find your way to better health using holistic medicine to help you overcome bad habits and addictions such as smoking, and teach you strategies for creating a better quality of life in general. Explore your options for your overall health help to stop smoking as part of your personalized quit plan. There are many books and websites devoted to this subject, then make a small research to find the products and services that may be most beneficial to you and start taking steps towards a present without dependence future. Medical statistics document that smoking is hazardous to your health. Regardless of the amount of literature and warnings, smoking continues. In addition to the dangers of smoking to one’s own health, the dangers of second hand smoke on innocent people continue to be a controversial issue. Rampant warnings of the danger and effects of smoking seem to have done little to stop the need to satisfy the habit. Some say the great debate over smoker’s rights may actually lead to smokers seeking natural stop smoking aids. The thought of liquorice as an herb can be quite confusing as images of twisted red string comes to mind. In reality, liquorice has been used for medicinal purposes for thousands of years and is considered to promote detoxification resulting in ridding the body of stored nicotine. This reason alone makes liquorice a top choice as a natural stop smoking aid. Additional studies show liquorice not only assists in removal of built-up toxins, but aids in other medicinal purposes as well. The most effective form of the plant as a natural stop smoking aid is the root. While most think of the candy purchased from the local store, the best choice for smokers is in the form of liquorice sticks. As a natural stop smoking aid to help reduce nicotine cravings, chewing liquorice can satisfy several components associated with the need to smoke. While many smokers have popped a peppermint candy as a breath aid, they may not be aware of the part it also plays as a natural stop smoking aid. Long known for its fragrant flavour and tingling effect, peppermint is also known to aid with breathing problems and the body’s circulatory system. Peppermint is said to help clean the body of nicotine. Many smokers who are trying to kick the habit drink peppermint tea or use it for aromatherapy. Slippery elm is another herb widely considered as a natural stop smoking aid. It detoxifies the body, eliminating the nicotine that has accumulated in the body as a result of constant smoking. This natural stop smoking aid helps clear up both the respiratory and circulatory systems, ridding them of poisons. Slippery elm comes in several forms: supplements, teas and infusions. The best thing to do, if you are interested in trying an herbal remedy is to investigate it weeks before you smoke your last cigarette, as some of these herbs must be built up in your system before they can help you stop smoking. You also need to start taking the herbal supplements that actually reduce the stress of quitting. The herbs that help prevent or lessen mood swings and/or depression often experienced by people who try to stop smoking must also be taken weeks before quitting. When the day comes to stop your smoking habit, have certain herbal items on hand that will help stop the cravings. These are available in kits to make it easier to have everything readily available to get you through the first few days, weeks, and months, if needed. 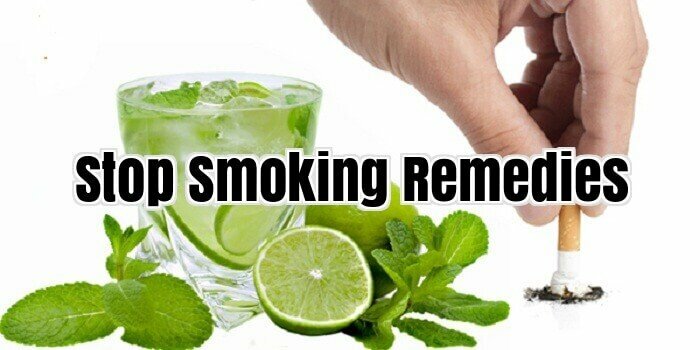 There are also certain foods that help people quit smoking. Things such as milk, celery, and red wine are natural ways to break the smoking habit. Between the herbal remedies and certain foods, you can quit smoking without any medication, which is much better than filling your body with drugs and more nicotine. This is a sponsored post, so I hope you will check out their website. I encourage people to use natural alternatives whenever possible, and their site is full of tips on what herbal remedy to use for many health problems. Here is the usual way smokers embark on their plan to quit smoking and fail. First, they would buy a good pack of cigarettes. And before starting to peel off the cover, they would tell themselves that after this whole pack that would be the time that they will never touch a cigarette ever again. And one day after not being able to light a stick, they would start to feel restless, irritable and unable to stay focused. They would start to literally salivate too over the thought of cigarette. And for the hope of eliminating this craving, they would start buying a stick. But a stick at that moment seems insufficient to sate the craving, so they would buy another two or more sticks. In order to not feel guilty about it, they would usually tell themselves that they will make up for it the next time or at least, they have consumed fewer cigarettes now. Until they would come to a point that they find themselves helplessly back in lighting cigarettes in full blown proportion, abandoning their mission to quit smoking. This is the vicious cycle that a lot of aspirants to quit smoking have to go through. It is okay to continue trying. A lot of those who successfully quit also had their share of failures too. And most of these failures happen because they preferred to be cold turkeys. Cold turkeys are those people who are quitting smoking without the help of any aids that would help them withstand the temptation of falling back to the vice of smoking. Some people, on the other hand, acknowledges the side effect of quitting smoking all of a sudden, hence, they made use of stop smoking aids to help them in their adjustment period. These aids are consist but not limited to the following: nicotine patch, gum, inhaler, nasal spray, candies, bupropion, varenicline tartrate, hypnosis, acupuncture, and stop smoking herb. Among the aids available in the market, stop smoking herb enjoys an increasing demand from smokers who wish to end their addiction to cigarettes. It is said to have positive results in preventing ones tendency to light up a cigarette. It also helps the smokers from their withdrawal which is associated to abrupt stopping of the habit. It is also eradicate mood swings that usually takes place during the adjustment period. These herbs look like the regular cigarettes and give the same sensation. The only difference is that they are healthier and nicotine and tar free. They also come with different flavours. There are so many methods and technique to stop smoking that you would dizzy yourself out trying to find memorize them all, especially when you are online trying to decide on which technique to use. The catch is that they all work with various levels of success for various classes of smoking patients, so that it is difficult to say that any one technique is better than the other. One stop smoking technique by which you can break the habit is to take stop smoking pills. Most stop smoking pills aren’t sold over the counter in drugstores, so you usually have to obtain a prescription from a licensed medical practitioner before you can get your hands on them. Most physicians also are wary of prescribing stop smoking pills for smoking cessation patients because the prescriptions tend to have the same nomenclature as antidepressant drugs, which when used wrongly can have a lot of harmful adverse effects. Perhaps the most popular stop smoking pill in the United States is the antidepressant drug bupropin. It is sold under the brand name Zyban, an oral medication that is used to inhibit the neuronal uptake of dopamine, serotonin, and other neurotransmitters in the central nervous system. Neurotransmitters are chemicals that carry communication signals between your nerves and they trigger your pleasure-seeking behaviour. When you have too much of them in your system, you keep wanting more of the pleasure that the nicotine seems to provide, so you go back to smoking. With Zyban, you stand better chances of staying off the substance. Chantix is another oral pill that doctors tend to prescribe for smoking cessation patients. Manufactured by Pfizer, it is FDA-approved and should be used only by adults who are trying to break the habit. Chantix contains varenicline tartrate, which helps to reduce cravings and to deal with withdrawal symptoms as well. Other antidepressants used in the same category are the tretracylcic types that norephinephrine from binding to nearby cells and resulting in reuptake. When nicotine is drawn into your lungs, it enters into your bloodstream and is pumped into your heart and brain. Although, it serves as a nerve stimulant that promotes the flow of adrenaline, it also speeds up your heartbeat and causes it to become irregular. Stopping smoking results in withdrawal symptoms that are often there within 24 to 48 hours, such as irritability, headaches, and anxiety, which is why the antidepressant drugs work well in smoking cessation. They keep your system calm and duplicate some of the effects of nicotine so that you can tide the withdrawal. The biggest challenge with the smoking cessation pills is that they largely have some side effects that many people are not too comfortable with. Many of them cause blurred vision, dehydration, difficulty urinating, sleeplessness, dizziness, and confusion. A few of the more severe adverse effects of stop smoking pills are nausea, constipation, unusual dreams, hallucination, and even vomiting. For these reasons, doctors may save prescription of pills to people who are trying to stop smoking for a time when they are certain no other technique will work. Along with hypnosis you can try herbs too to stop your smoking problem. There are many ways you can use herbs. One special way is to prepare a proprietary herbal blend. This innovation has been quite successful in several cases. It’s taken in prescribed courses and often the results show that cigarette craving get stamped out for good. There are signs already showing you that smoking is bad for you. Your coughing isn’t getting better; it’s sounds coarser and comes more frequently especially when you wake up. A little running or walking leaves you heaving trying to catch some breathe. These are signs poking you on the face, telling you its time you “quit”. The human body was cleverly wrought or wired. It will take the toll your smoking will inflict on it. It can get damaged and suffer considerably. But when you stop it responds and positively too. The system begins a steady process of self-repairs. Never say it’s too late that the damages your smoking lifestyles have caused will never go away. That sounds earnest but even excuses can sound earnest at times. Start the quitting now. You will save yourself so much like an Alzheimer. Two ailments you wouldn’t want to suffer even in your nightmares. Smoking is a health hazard for you and your kids. And I’m not thrashing out the second rate smoker effects where your kids are engaged because you puff around the home. I’m talking of your kids inheriting birth defects or getting afflicted with SID’s. Smokers suffer all sorts if you’re count the demerits off your finger derisively to underscore the point that there are no new health issues anymore will be acting a little above conceit. Do you know that smoking can steal your sight as time goes on? Old age with all its worries is “bad” enough how much more living it out like a bat. If you don’t love the flagging looks of old Coney next door. You might have to give your smoking habit some serious thought. That your old next-door old distant neighbour may not have been such a smoker is not the point. Is he looking sagged, flabby and floppy? That same look is a havoc smoking can wreck on you. You waste money sustaining a smoking habit. Now it doesn’t look that serious if you’re counting in terms of how many sticks you smoke. And even after you look at it cumulatively it may not seem too threatening. The threat becomes more real. Stop smoking programs exist for you. So if you have a smoking habit you wish to drop don’t hesitate they are there for you. And for stop smoking medication there’s been some useful intervention too. This is in true nature of insurance coverage for stop smoking medication. If you get these drugs you won’t pay from your purse. Maybe you tried to stop smoking, but your attempts were failure. You are going to take some stop smoking tablets, but you don’t know what medicines or methods to use. If you are such person, we can help you to solve your problem and suggest you to take stop smoking pills. We distribute Herbal stop smoking medicines during many years and have vast experience in this field. Among our clients were people, who smoked many years and who smoke some months. And we can affirm that we helped to most our clients. In the field of herbal medicines you can find many stop smoking products, but relying on our experience, we suggest you to take stop smoking pills NicoNot. Among herbal stop smoking medicines NicoNot is the safest and very effective. It is 100% natural stop smoking product. 9. Emblica Officinalis cures your lungs; it rebuilds blood, cells and tisues too. Using stop smoking pills NicoNot, you will avoid all these morbid sensations. Moreover, in contrast to other stop smoking products, NicoNot is nicotine free. And using this medicine you are protected from any dose of nicotine. The herbal stop smoking pills NicoNot is clinically tested and it is legal medicine. All herbs, which are in stop smoking pills NicoNot are tested and we assure you – they are safe. All ingredients of NicoNot are ecological-friendly, pesticides free, manually inspected. In that way, using herbal stop smoking pills NicoNot you will make healthier your entire organism and as a result the quality of your life will by higher. Stop smoking herbs have been around for a long time, and it seems that they can really help people stop smoking. Those natural properties can be found only in stop smoking herbs. These stop smoking herbs have many curative uses and have been found to contain properties that help alleviate the effects of nicotine withdrawal. People, who have used stop smoking herbs swear by them as they have used them for aid in coping with nicotine withdrawal symptoms and say that they have had no depression, just good moods after the use of stop smoking herbs… Mullein: This is a medicinal herb that acts as an expectorant. It helps soothe inflamed and infected lungs. It aids in breaking up congestion to promote coughing. Years ago, this herb was smoked by TB sufferers to aid coughing to clear the lungs. It is a lung cleansing herb. It is very gentle and can be used in place of tobacco. It contains no nicotine and will help with chest congestion in colds and flu. Non-smokers can use the tincture of this herb or Mullein tea. It can be used as a stop smoking herb as it can be smoked in place of cigarettes. Warning: The incorrect use of this herb can cause drowsiness, weak pulse, vomiting and even respiratory failure. You should definitively get the ok from your doctor before you start using it. It is recommended that you speak to your doctor before taking any herbal medicine as some herbs contain sub-substances of medicines and might contain properties of drugs which could be in conflict with medicine you might already be taking for a medical condition.